I think that step-thru concept, as seen on the Dahon Ciao, made the Ciao a hugely popular bike. MrsC and I are on holiday in Belgium. Loads of bikes. Mostly 'Dutch' utility things which look too big for the riders, particularly when said rider is a child and the bike has been bought for them to 'grow into'! Also, lots of kiddy-seats, tag-alongs, trailers and the like for transporting smaller ones. This is the most unusual one so far. It does only have two wheels and the front one is the steering one! No idea what it would be like to ride! 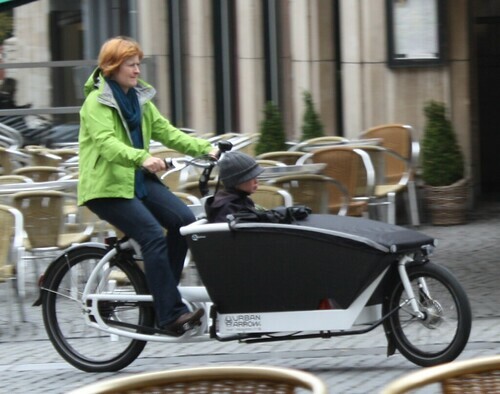 From the in-depth review found here: http://bikes-as-transportation.com/third-generation-electric-cargo-bike/ it sounds like the handling is akin to an oil tanker. Disappointed! I'd read it as Urban Barrow. Excuse te crappy mobile phone photos. 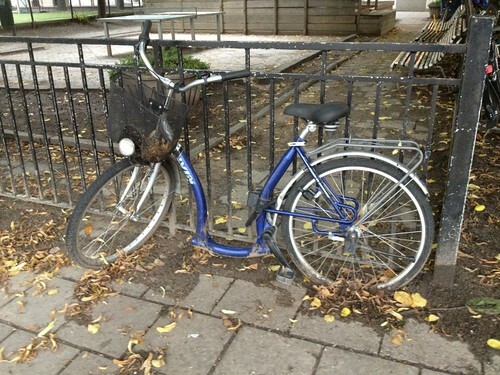 BikeSnob NYC occasionally posts pictures on his blog of bikes with "interesting" cockpit ergonomics, but I think this tops anything I've seen there. 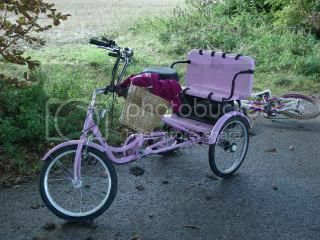 I saw a wheelchair the other day with half a bike attached at the back. Person at back pedalling and steering. One visit to The Blacksmiths Arms @ Naburn saw us sharing the beer garden with a group that had one of them, plus other adapted bikes. Possibly Clarion and Butterfly's local, as last year (2011) they visited it more times than any other pub, despite it being >150 miles from where they live! If only I'd had a camera with me . . .
'Hirondelle' on the down tube in fancy script. Very elaborate lugs, lovingly lined. Reynolds 525 transfer on the seat tube, & Reynolds transfers on the forks. Smallish wheels, but looked as if built for bigger: loadsa clearance. Fattish tyres. Braze-ons for everything, including pump. Rohloff speedhub, 14 gears. Proper eccentric bottom bracket. Rohloff grip shifter held on bullhorn (cut down drops?) bars vertically with cable ties. Canti bosses, only front set used (brake lever on front right end of bar): no rear brake. Bars mounted on aheadset, behind steerer tube. Anonymous rack with no light fixing plate, & Cateye LD600 held on with two strips of insulating tape, covering part of the light. A bizarre mixture of the sublime & the utterly crap. Broad Street, Reading, this afternoon. This bike's been bothering me. I've tried looking up the frame, but can't identify it. Can anyone help? See above. 'Hirondelle' in fancy script on down tube, Reynolds 525, very elaborate lugs. Dark green paint, lugs lined in dark yellowish ('old gold'?). Touring braze-ons. I don't see how it can be anything to do with the old French Hirondelle brand. According to Wikipedia and other sources, Hirondelles were manufactured until the 1960s but the Paris police carried on using them till 1984 and the brand became their nickname. I'm sure what you saw couldn't be an ex-police bike, but maybe the rider is a policeman? Seems unlikely. Why would a former Paris policeman be riding a bizarre bodge-up based on what looks like a good English touring frame built years after the (totally different) police bikes with the same name were retired? I'm sure the name is a coincidence. It's a common enough word: French for swallow (the bird). Speaking of swallows & birds, but straying OT, the brother of Peter Bird of Swallow Cycles is of this parish. I don't think it's at all likely either, I just thought I'd mention it. Look, here's a hipster video from Paris, supposedly about a Hirondelle. Wikipedia's disambiguation page mentions six different things the name could refer to without any entry for the bikes. Perhaps the rider is a train buff or a fan of the Saint? Or then again perhaps not. I strongly suspect that the current owner is not the person who bought the frame new. As I said, it looks like a good touring frame, currently crudely bodged up. I find it hard to imagine that whoever bought a nice frame with lugs & paintwork like that would then mess it up with bullhorns that look as if they've been roughly cut down from drops, fasten the Rohloff shifter on with cable ties, ride around with only one brake (or is there a fixed option for a Rohloff?) & stick a rear light on with black insulating tape. Wow, something that makes the Raptobike drivetrain look like a sensible design decision. As any darksider knows, the issue with that sort of thing isn't chain cleaning so much as leg cleaning. Not especially interesting or unusual but, when we were leaving Edinburgh about 11.30 today near the Barnton junction, we saw a guy on a drop-dead gorgeous silver and maroon Dave Yates compact steel frame. It looked really classy. I just wondered if any of the locals on here recognise it. "That's a nice bike, you don't see many of those around... it's a Paris-Galibier isn't it?" There was a bit of confusion because the old boy didn't understand my accent. He thought I was Dutch. Anyway, he said he'd bought it a from a friend, who happens to be one of the old stalwarts of my club. We had a brief chat about our mutual acquaintance and another old stalwart who died a couple of years ago who had something similar (turns out that was a Flying Gate). On my way to the start of the TPM on Saturday I saw, cycling the other way along Narrow Street, eight St John's Ambulance cyclists riding in near perfect formation (2x4). Parked in the horrid underground Sheffield stands next to my bike when I came out of Ikea was a Soma Saga. Pretty much like that one but blue, same very high bars. The rider appeared at the same time - it's from San Francisco, he's from Canda and he really ought to be using more than a flimsy cable lock in an underground car park in Bristol! Here is a picture of the singlespeed my No. 1 son bought during his recent sojourn in Los Angeles. Sans conventional front or rear brakes. Single speed with back pedal hub brake. A back pedal brake is a rear brake!